With tremendous pride and a full heart, Karla Raines presented the Denver Commission on Cultural Affairs (DCCA) with IMAGINE 2020: Denver’s Cultural Plan at their January 2014 meeting. The commission had been strong proponents of a refreshed cultural plan for Denver. These volunteers served as Corona’s creative muse throughout the 15-month process. They held firm in their belief that Denver needed a research-driven plan that was strategic by design and held forth a bold vision for Denver. Their insistence that the process be community-driven resulted in a cultural plan that speaks to the aspirations and expectations of Denver residents. 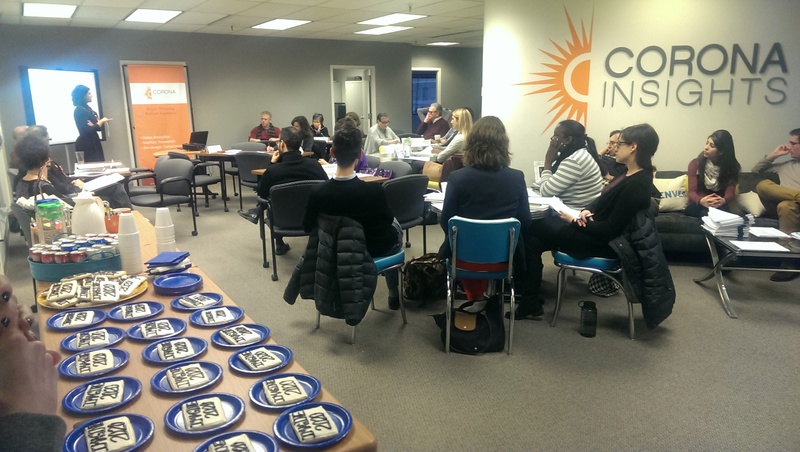 Corona was happy to host the commission’s monthly meeting in their downtown Denver office (pictured below). A celebratory toast and freshly baked cookies from Maggie and Molly’s Bakery capped off the event. Stay tuned! IMAGINE 2020 will be revealed to the public in early March. . Visit ImagineDenver2020.org for more information. Pictured: Ginger White, Deputy Director of Denver Arts & Venues, addresses the Denver Commission on Cultural Affairs, A&V staff and Team Corona.